Drywall is very nearly complete. Our crew of two rockers worked late last week to finish hanging all the walls and ceilings. Tim the taper has made three full passes through the house, each time smoothing over the taped joints and screw holes with a fresh layer of mud. (He makes the mud by stirring some water into his joint compound, using a little more water with each coat for an increasingly uniform finish.) Finally, the sander comes today and tomorrow to make the walls absolutely flat. A heat lamp makes the mud dry faster on the second floor. The master bathroom gets mold-resistant Green Board. A “Winooski chandelier” illuminates the basement. Terry, Colin and I kept ourselves outside all week. This morning we tackled siding between the grill porch and the back of the Barn. With several bottom-of-wall elevation changes, it was tricky to piece together the J-channels that frame around the siding. Once we cut the channels right, we nailed them perfectly flush to the bottom of each wall and along the vertical edges. 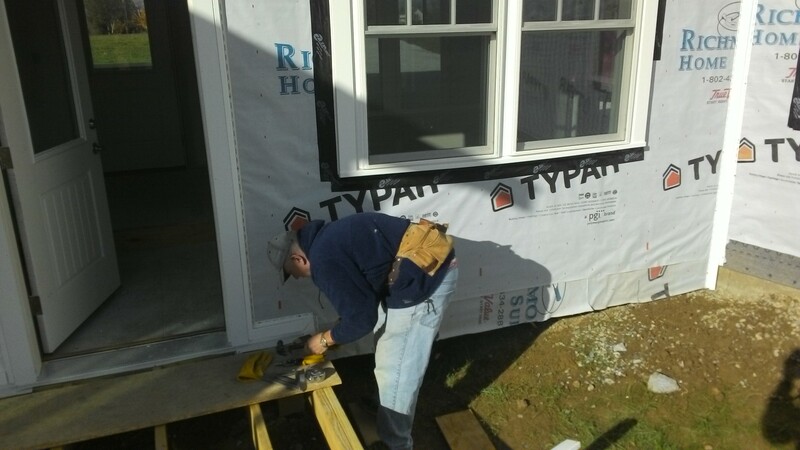 Colin fusses with the J-channels so they’ll trim out the siding just right. With the siding itself, we tried to satisfy many criteria at once. 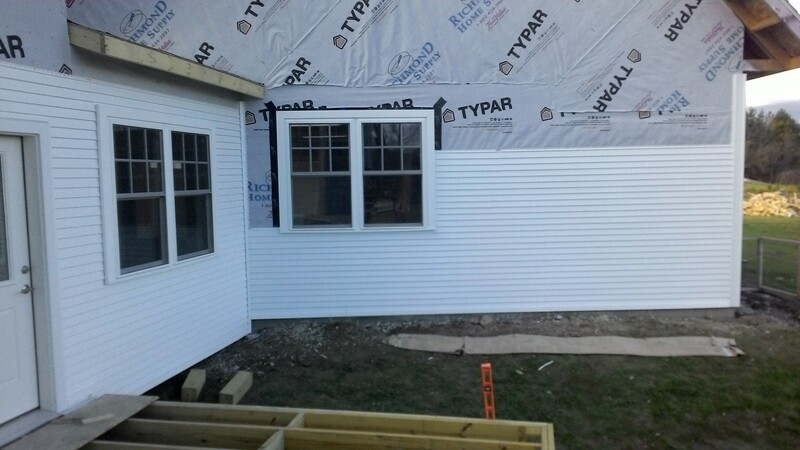 The goal is to nail each course of vinyl as level as possible, parallel to the courses below and above, aligned with the siding we already installed on nearby walls, and running straight with respect to window sills and headers. In theory these criteria should never contradict each other, but in reality there’s always a marginally crooked window, or the line spacing we need to follow isn’t quite even. So we have to compromise for a best fit. It was a struggle today (though far better than yesterday when I sided the same wall three times before I got it right… it’s no fun pulling nails and ripping out the siding you just installed), but I’m very pleased with the result. A huge portion of the house remains as yet unsided, so we’ll be at this task well into the forseeable future. Fortunately it’s not our only task… tomorrow we aim to finish the porch roof!